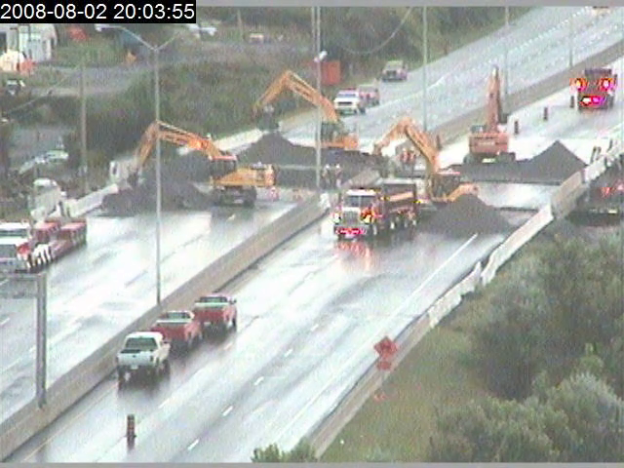 On the weekend of August 2-3 2008, the Queensway (Highway 417) Clyde Avenue Bridge was replaced using a new rapid replacement method. This involved lifting the existing bridges out and replacing them with new bridges that had been prefabricated on a site nearby. The whole process of replacing the bridges could be completed in less than a day as compared to up to 2 years by regular methods. This is the same process that was used last year to replace the Island Park bridge. 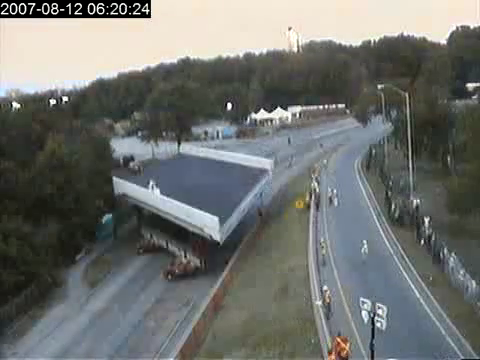 The MTO had a website with a webcam setup so people could watch the “action”. As I did last year, I grabbed the images from the website as the action was unfolding. The video below is the result of those images and allows you to see what happened. It’s not quite as “exciting” as the Island Park bridge move last year but at least this time the camera is reasonably static. This entry was posted in General, Technology and tagged Highway_417, MTO, Ottawa, Queensway, rapid replacement, time lapse video on 2008/08/03 by Jeff Ivany. The Globe and Mail has a story on a new take on prefab housing. A new address, fresh off the line describes the assembly line approach to prefab housing that Mattamy Homes is currently using in Milton, Ontario. The method they use is to build the houses in a “factory” on-site and truck the entire (almost) finished house out to be placed on an awaiting foundation. In 10 days a house is completed and ready to be placed on the foundation. All that remains to be done is to perform final finishing work. I’m wondering if Mattamy Homes will be using this concept here in the Ottawa area when they start construction of the Half Moon Bay community in Barrhaven. If so, it would be interesting to go and see the process. There are also some other benefits that the article failed to touched upon. Think about how nice it would be to move into that neighbourhood while it is still under construction. You’d be less likely to have to deal with construction noise during daylight hours as the prefab houses would be dropped in to place. No hammering day in and day out! This entry was posted in General, Technology and tagged Barrhaven, Globe and Mail, Half Moon Bay, Mattamy Homes, Ottawa, prefab houses, prefab housing on 2007/09/08 by Jeff Ivany. On the weekend of August 11-12 2007, the Queensway (Highway 417) Island Park Bridge was replaced using a new rapid replacement method. This involved lifting the existing bridges out and replacing them with new bridges that had been prefabricated on a site nearby. The whole process of replacing the bridges could be completed in less than a day as compared to up to 2 years by regular methods. The webcam was updated every 30 seconds (roughly) and the video above is encoded at 5fps. In total it’s about 7 minutes long. Unfortunately, the video only starts around 10:30PM as I had some technical difficulty with the images I had captured in the first couple hours. Well, that and I only thought to start capturing after everything had already started. The camera operator was moving the camera a lot at times so it can be very difficult to see what is happening during those periods. Updated: Oops! Sorry about the last 45 seconds or so of the video, I didn’t realize I had left in those last frames where nothing was happening. This entry was posted in General, Technology and tagged Highway_417, Island Park Bridge, MTO, Ottawa, Queensway, rapid replacement, time lapse video on 2007/08/13 by Jeff Ivany. Not to bad considering it is already half way through January! 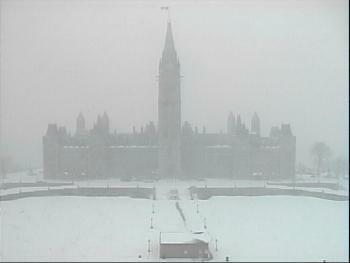 This entry was posted in General and tagged Ottawa, Parliament Hill, winter on 2007/01/15 by Jeff Ivany. This weekend I attended Jeff’s brake pad and rotor replacement 101 course in his driveway. The donor car was my 2004 Sunfire (since it needed new brake pads and rotors according to my mechanic) and the attendance was rather pathetic – Jeff was there and so was I. Yeah, so Jeff offered to help me do a brake pad and rotor replacement job on my car because I mentioned how much the garage wanted ($250) to do it and he said it was super easy on the Sunfire (or Cavalier in his case) and that he would show me how to do it. I picked up the parts from good old Canadian Tire which happened to have their Monroe brake pads on sale. Canadian Tire also has this fantastic loan a tool program where you can borrow some of these expensive specialty tools for no cost. I needed a tool to push the caliper piston back in once we replaced the brake pads and it turns out that is tool kit #18. I called around to a couple of the Canadian Tire stores in the Ottawa area (turns out the Kemptville store no longer loans tools as they had a bunch stolen) and finally tracked down kit #18. Saturday afternoon we show up at Jeff’s place and start the job. Sure enough, the actual brake pad and rotor replacement only took a little over an hour for both front tires. It was quite easy. The problem came with trying to put the lug nuts back on the second wheel after we were pretty much done. See, while trying to remove the rusted on rotor, we had to resort to a hammer to convince the rotor to let go of the wheel bolts. While I was bashing on the rotor, my aim was a little off and I managed to destroy the thread on a couple of the bolts. This resulted in not being able to put the lug nuts back on. Aw crap. Back to Canadian Tire to see what we can do. It turns out that the bolts are super easy (and super cheap) to replace, as long as you can get loan a tool kit #10 from Canadian Tire. Yeah, so we couldn’t get kit #10 anywhere in the city. I bought a couple new lug nuts to see if that would make any difference. It did because we were able to get 4 of 5 lugs back on. The problem was with that fifth stud. Needless to say, we managed to shear the stud off completely. Anyhoo, we called it a day after that and I went home. Monday morning I dropped the car off at my mechanic’s garage and it turns out I should have just paid him the $250 to do the brake job in the first place. Almost $150 worth of labour and parts just to replace the studs on one hub. Now my brake job that started out at half the cost of what the mechanic wanted has cost me a case of beer more! This entry was posted in Automotive, General, Kemptville and tagged Canadian Tire, Cavalier, Kemptville, Ontario, Ottawa, save money, Sunfire on 2006/11/28 by Jeff Ivany.